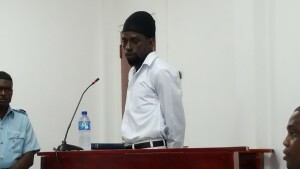 Camp Street Prison inmate Owen Belfield, on Friday told the an inquiry into a recent unrest at the prison that he once posed for a photo to be taken of himself and another prisoner Collis Collision while he was an inmate at the jail. This is in light of conflicted testimonies being given by Prisoners to the Commission of Inquiry relative to the availability of certain prohibited items to prisoners at the jail. Since the commission started two prisoners have acknowledged the presence of cellular phones, marijuana, improvised weapons and other illicit items in the prison; however others have managed to deny ever seeing such items. Under cross examination by Prison and Police Attorney, Belfield, a murder accused, stated that at one time he hasd posed for a photo with another inmate, identified as Collison. That photo was later posted to Facebook; however Belfield said he was not aware that the photograph was posted to social media. He acknowledged too that the photograph was taken with a mobile phone, confirming that prisoners have access to phones and social media despite being incarcerated. “It was just one time sir”, the inmate stated. The 28-year-old also told the three-person commission that he did not see any prisoners being beaten on March 3 when prisoners would have reportedly rushed back inside of the dormitory after seeing fellow inmates being severely chastised. “I didn’t see any inmate being beaten sir – they was carrying them away,” he said while being cross examined. Explaining what happened at the time of the blaze that killed 17 inmates, Belfield stated that he was just about to exit the dorm when the door slammed in his face. The door was shut by someone whom he identified as Officer Holligan. Under further cross examination by Attorney Dexter Todd, he recounted that it was moments after this that he noticed the fire at a hole that connected Capital A with Capital B. Asked if someone from Capital A lit the fire, Belfield responded in the affirmative but could not state who that person was. “When I see the fire I walk and stand up looking at it…when I see the fire I just come to see is wuh really going on why the mattress burning so. Me ain’t ask nobody no question,” he stated.